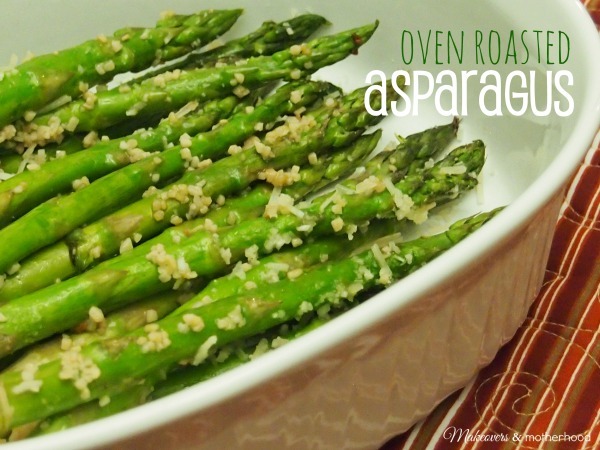 We are veggie lovers here, but I have to admit that asparagus is one veggie thatrarely gets a spot at the table. When our oldest was about 18-months old, he would happily eat asparagus and without question. But for some reason we moved away from it. I know, I must be crazy… if the kid eats it, we should’ve been eating it all the time! It’s been about 3 years since I made asparagus. But needing some different healthy side dish options, these fun little green spears stood up and got my attention at the grocer. I prepared it the same way I used to and it was once again happily welcomed at our table with a pleading to have it again. Not only do I love that it’s healthy (low cal and low carb), but super easy! Lots of flavor for very little prep! That’ my kind of cookin’! Wash asparagus spears. Trim off and discard tough ends. Arrange asparagus in shallow baking dish. Drizzle garlic and oil over asparagus. Turn stalks to coat. Bake asparagus until tender, about 18 minutes.